Colored glass block walls allow homeowners to create a unique look to various areas of their homes. From bathrooms to outdoor kitchens, your wall can be a work of art. Glass blocks allow light to travel through a space while providing structural stability, privacy, and beauty to your home. There are hundreds of ways to use them, in large projects such as a wall as well as smaller projects like backsplashes. They cannot be used as load bearing walls however, so do plan placement carefully. Walls in showers and bathrooms. By using a combination of traditional glass blocks and colored glass blocks, the homeowner can achieve interesting pattern effects of light and color in almost any room. 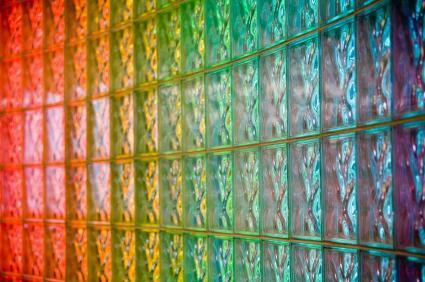 Colored glass blocks for use in walls are available in a variety of sizes and shapes. Virtually any shape or size wall can be accommodated in almost unlimited designs and colors. One of the newest techniques being used with glass blocks is fiber optics. This allows the blocks to be a light source rather than just allow light to filter through them. The combination of fiber optics and colored glass can bring a dramatic look to a room that would otherwise be dark and unappealing. Because of the low energy use, using colored blocks with fiber optics can be a way of saving on energy costs as well.It is important to keep other types of lighting away from these applications. The look will be at its most dramatic and appealing when surrounded by a dark area. Decorative options using colored glass blocks are numerous, because they can be created in unlimited custom colors to match or enhance any decorating scheme. Use one color to create a bold statement. Add random blocks of color to a clear glass block wall. Make stripes or a checkerboard pattern. Manufacturers are also creating glass block murals by fusing colored glass onto glass blocks. These murals and other designs are not decals or painted on but are actually part of the block itself. The fusion process means that the color cannot be scraped off or scratched. Imagine a shower surround created from blue glass blocks with tropical fish designs to get an idea of the decorating potential of this product. Colored glass walls are put together exactly like clear glass block walls. The most cost-effective way to assemble the walls is to use prefabricated panel sections. Many panels have a spacer system that makes it easy to stack wall sections on another wall. An additional way glass blocks can be put together is with mortar or silicone joining each individual block. Prefab panels are quick to install. Prefab panels help keep the wall level and plumb. Prefab panels are best used in a simple construction. Using mortar in the joints makes it harder for most do it yourself projects unless you are experienced. Using mortar is more time consuming. Using mortar allows you to make unique shapes, curved walls, and other special designs. Using colored glass blocks for walls is a unique way to add color and light to your home. By using them in half walls you can create the illusion of separate space while maintaining an open look. Colored glass blocks incorporated in a full wall application allows you to add light to rooms that don't have many windows. Whether you do it yourself or hire a contractor, colored glass block walls are a great update for nearly any living or office space.